The festival La Mercè, which is held in honour of the patron saint la Mercè (the Virgin of Mercy) on September 24 each year is the "Fiesta Mayor" - the main festival - of Barcelona. It is the largest and most colourful festival in the city's festival calendar and the absolute climax of Barcelona's event schedule. The main events of the festival take place on September 24. But during the entire week before and after La Mercè there are many events in Barcelona. Quite often there are up to 500 events taking place in the scope of the Festes de la Mercè in the area of the whole city, mainly in the centre (activities not confirmed yet). The human towers of the castellers, as their builders are called, are to be as high as possible. Performances take place at the Plaça de Sant Jaume in the Gothic Quarter, which is then filled with thousands of people. Click here for detailed information on the Castellers. The procession usually takes place on the Via Laietana (Metro: L4, Jaume I.) at nightfall. Fire-breathing dragons, accompanied by dangerous devils and other monsters march the streets and scare the people with lots of fireworks and bangers. There is a more harmless Carrefoc for children taking place before the actual Carrefoc. Our tipp: Put on some clothes that will not be ruined by a few sparks. If you want to see the dragons at a close range, it is advisable to wear glasses. At the Carrefoc for adults, the sparks of some fireworks are whirled directly at the visitors. Giant figures of queens and kings, nobles and saints march the streets of Barcelona. The giants dance on the streets, march around in circles, accompanied by the play of flutes and drums. Legend has it that on the night of 24 September 1218, the Virgin of Mercy appeared to King James I of Aragon, Saint Peter Nolasco and Saint Raymond of Penyafort at the same time. She gave all three of them the order to liberate the Christian monks, who were held captive by the Saracens, as the Moorish occupants were called. It was a time of religious wars. Centuries later, in 1687, the Virgin of Mercy shielded Barcelona from a plague of locusts and freed the city of pestilence. The city council made her the patron saint of Barcelona, which was not recognized by the pope, though. The decision was only ratified two centuries later in 1868. During the Spanish Wars of Succession, she was handed the command over the city's defence in a hopeless situation in 1714. On 11 September 1714, Barcelona was taken by the Spanish and French Bourbon armies. The image of the patron saint is now kept in the Mercè Basilica at the Plaça de la Mercè (Metro: L3, Drassanes). After pope Pius IX had declared the Virgin of Mercy the patron saint of the city, festivities in her honour were started each year in September. 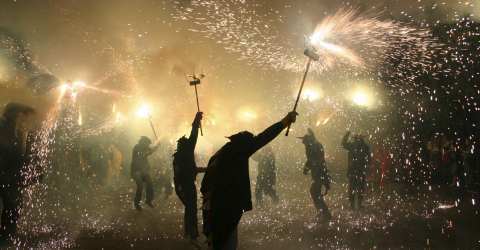 On an initiative of the politician Francesc Cambó, the festivities were turned into a major festival in 1902, which still serves as a model for almost all city or town festivals in Catalonia. The history of the festival la Mercè is full of ups and downs, from times of the Civil War and the era of Franco. With the establishment of democracy after the time of Franco, La Mercè became the most popular festival of the city thanks to the cooperation of organisations from all parts of the city. Today, several hundred events take place in the entire city area with the general topic of Mediterranean culture. The events show that the festival Le Mercè lives up both to the tradition and modern art and culture.